Further information on each of the themes can be found here. The conference will include invited key note papers, contributed papers, posters and workshops, as well as field trips in the ACT region to examine on-ground plant conservation activities. Registration for the conference will open in mid April 2012. To register an interest in attending the conference or presenting a paper, poster or workshop, please contact the ANPC. 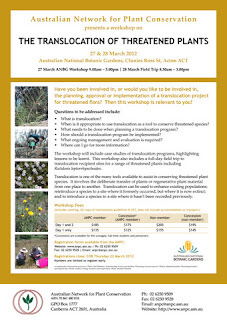 The Canberra workshop on the Translocation of Threatened Plants is now less than three weeks away and spaces are filling fast. Click on the image above to view the workshop flyer and visit the workshop web page for more information and to register. Restoration practitioners and interested parties in New South Wales are invited to participate in a survey on the current and future use of local provenance seed source for restoration projects in New South Wales. The survey is being conducted by Nola Hancock, a PhD student at Macquarie University and forms part of her thesis into the role of plant provenance in restoration ecology under climate change. The survey aims to collate information on the current use of local provenance plants in restoration projects in New South Wales and the appropriateness of current seed-sourcing guidelines. The results will be published in a peer-reviewed journal and will be made available to the wider community upon request. Participation is voluntary and should take less than 15 minutes to complete. To complete the survey click on http://bio.mq.edu.au/piccel/nhancock.html and then scroll towards the bottom of the page to find the link to the survey. The survey closes on April 12th at 5pm. To participate or request further information please contact Nola by email nola.hancock@mq.edu.au or phone: 0419 262 116. Myrtle Rust is an introduced plant disease that infects many species in the family Myrtaceae. It has naturalised in coastal areas of NSW and Queensland, and has recently arrived in Victoria. The ANPC’s comprehensive one-day workshop ‘Myrtle Rust – a new threat to Australia’s biodiversity’ has been delivered at 11 NSW regional locations and one in Queensland. Course notes are being fully updated and further national roll-out is planned. Please register your potential interest in either attending or in helping to organise a workshop by contacting Bob Makinson. Domestic quarantine provisions are in place – see www.quarantinedomestic.gov.au/myrtle-rust.html for links. Myrtle Rust Forest Industry Issues Paper (Forest and Wood Products Australia - dated ‘June 2011’ but apparently only released in December. This paper attempts to assess the likely impact on commercial forestry in Australia, and contains the only (so far) public post-mortem on the initial 2010-11 response effort. Management Plan for Myrtle Rust on the [NSW] National Parks Estate (Oct. 2011, NSW Office of Environment and Heritage). An updated Management Plan for the greenlife sector has just been released by Nursery & Garden Industry Australia. The Australian Nursery Industry Myrtle Rust (Uredo rangelii) Management Plan 2012 updates host lists, plant interstate movement controls, and fungicide treatments. This remains by far the most comprehensive guide for everybody in the plant growing and distribution sectors. Myrtle Rust is well naturalised in coastal areas of NSW and Queensland. In these States, the distribution has remained fairly stable over this wet summer (near-coastal areas from Batemans Bay to about Rockhampton, and in Qld inland to about Toowoomba). In January it was detected for the first time in Victoria. The host-list for Myrtle Rust has expanded greatly. Since its first detection in Australia in 2010, Myrtle Rust has now been found to infect more than 200 native plant species. The severity of infection, and apparent impact on plants, varies greatly between species. Some genera seem to have most or all species consistently prone to severe infection – these include Rhodamnia, Rhodomyrtus, and Gossia. New seasonal growth is also attacked severely in Melaleuca quinquenervia. Separate host lists for each State, all fairly up to date, are linked from a new Commonwealth site: www.myrtlerust.net.au (select links). In Victoria: As at 24 Feb. 2012, Myrtle Rust was known from 25 sites in and around Melbourne and one in the Otways region. Most Victorian sites so far are in production nurseries and plant wholesale outlets, but at least one is in public parkland, and following the pattern in the earlier States naturalisation of the rust on plants in open cultivation and in bushland can be expected. However, attempts are still underway to contain Myrtle Rust to the outbreak area. To report suspected myrtle rust anywhere in Victoria, please telephone DPI on 1800 084 881, and/or email digital photos of the suspect material, plus location and your contact details, to plant.protection@dpi.vic.gov.au. DPI Victoria is running awareness workshops: next ones are at DPI Knoxfield on Friday 2 March and Friday 16 March – for more details contact plant.protection@dpi.vic.gov.au. Elsewhere: A variant of Myrtle Rust’s parent ‘species-complex’ (Guava Rust or Eucalyptus Rust, Puccinia psidii sens. lat.) has now been reported from southern China. Specimens were collected from Rose Apple growing in Hainan in 2009, and are confirmed as P. psidii by Zhuang & Wei (2011; Mycostemma 30(6): 853-860). This is the first occurrence on the Asian mainland (Hainan is an island, but only just). The vast diversity of Myrtaceae in South-west Asia and the south-west Pacific is now at great risk from this disease. Human movement of infected plant material, and probably of spores on clothes and goods, are a major vector for the disease. People travelling from eastern Australia into these regions should take great care to launder all clothing and equipment before departure, especially if trekking or visiting lowland forest areas. Update prepared by Bob Makinson. ‘Biodiversity Guidelines - Protecting and managing biodiversity on RTA projects’ has been released by NSW’s Roads & Maritime Services (RMS - formerly the Roads & Traffic Authority, RTA). These Guidelines are intended for use by RMS staff and contractors, but provide a valuable template for other public- and private sector utilities providers in all States. The key to Environmental Weeds of Australia, previously only distributed as a DVD, is now available for free online, courtesy of Biosecurity Queensland. This interactive identification and information resource for over 1000 invasive plants is an invaluable resource for all those involved with research, training and management of environmental weeds in Australia, especially State and local weed control officers, Bushcare and Landcare volunteers. The Inland Rivers Network has organised a workshop on caring for critical aquatic inland habitats, as part of the Federal Government’s Caring for our Country grants program. The EDO will be presenting on how to write an effective submission in the context of consultations currently being held on the draft Murray Darling Basin Plan. RSVP by Friday 16 March to Emma Clegg on (02) 8580 6609 or email admin@irnnsw.org.au. Source: EDO NSW Weekly Bulletin. Rick Farley was one of the architects of the national Landcare program, which created a wholly new level of dialogue and engagement between the farm sector and the conservation sector. He was one of the all too rare creative and honest free-thinkers on Australian natural resource management – among many other things. His death in 2006 left us much poorer in the debates over water, land use, and rural conservation. ‘A Way Through: The Life of Rick Farley’, is by Nicholas Brown and Susan Boden, and published by New South Books (ISBN 9781921410857; paperback released February 2012, rrp AUD$39.95). Andrew Campbell recently posted a good review of the biography at The Conversation. More than 30 councils from across NSW will share in nearly $1.3 million to restore, revegetate and protect roadside vegetation as part of the Roadside Vegetation Implementation Program. The program is an initiative of the NSW Environmental Trust to help councils implement practical actions to manage their roadside vegetation. It is administered on behalf of the trust by the Local Government and Shires Associations. Forty-six grant applications were submitted and 11 of the projects that attracted funding were in council areas with populations of less than 20,000 people. President of the Shires Association, Ray Donald, said the grants would provide a boost for smaller rural and regional councils, allowing them to carry out vital roadside conservation works and help regenerate ecological corridors. President of the Local Government Association of NSW, Keith Rhoades, said councils that submitted applications for joint-initiatives were also eligible for a maximum grant of $100,000, enabling a greater scope of conservation works to be carried out. Cr Rhoades said other projects to receive funding included removing environmental weeds, bush regeneration, improving signage of environmentally sensitive areas and staff training to ensure roadside vegetation areas were protected. The Victorian Government’s attempt to reintroduce cattle grazing in the Alpine National Park has been blocked by the Commonwealth. Cattle were removed from the Alpine National Park in 2005 by the Bracks Government. Reintroduction of seasonal grazing in the Park was one of the first acts of the Baillieu government in 2010, nominally as a 'scientific cattle grazing' trial directed at reducing bushfire fuel-loads on crown land. The trial was aborted when it became clear that Commonwealth permission was needed, due to the likely presence of federally listed threatened species within the grazing zones. For more views and background visit the Victorian National Parks Association website. A private member’s bill to establish an accreditation scheme for ecological consultants was voted down in the NSW Upper House on 16 February. The Threatened Species Conservation Amendment (Ecological Consultants Accreditation Scheme) Bill 2011 would have required ecological consultants to undergo formal accreditation and included a mechanism to peer review ecological assessments that come into dispute. The bill had been proposed by Greens MLC Cate Faerhmann.